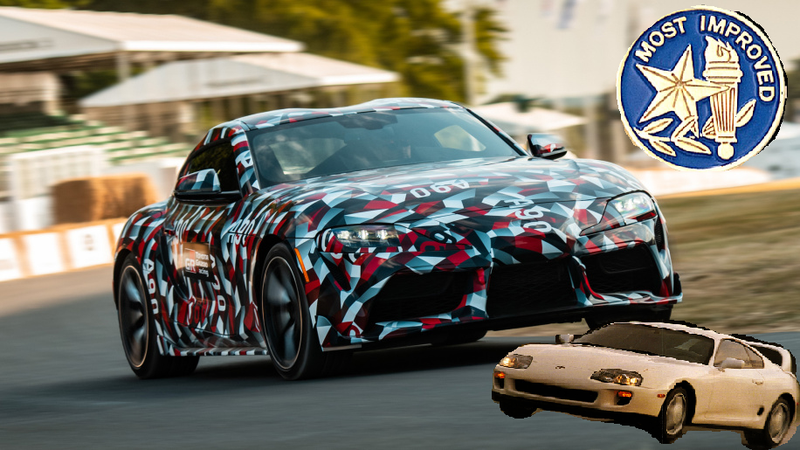 The 2019 Toyota Supra is really gunning for the 1993 Toyota Supra. Meanwhile, the 2019 Miata dwarfs its 1993 variant with greater than 50% improvements in both peak power and torque, better performance in every regard, far more variety, arguably similar driving engagement (minus EPS and DBW), while marking a near-unique vehicle despite Fiat borrowing its platform. I look forward to a bafflingly-close comparison between the JZA80/Mk IV and pseudo-Yota close in every regard but for the unflattering 26-year age difference. Of course, the Miata is just an example; this progression from 1993 to 2019 is to be expected, and can be seen in anything from the Mustang GT going from a humble Windsor-powered Foxbody to a 460-horse coupe at home on the track and highway, or the Dodge Ram from an agricultural F-100 contemporary to a cushy hybrid cruise missile. But no one is asking the real question: will the Twin Power Turbo™ Supra still targa top? Because in our current age, the Miata can!